Today marks the end of the 15th week of That Business Show with Jamie Meloni and its been a blast talking to new business owners each and every day on this program. The show airs weekdays at 8am on 1250WHNZ and is available anywhere in the world via the iHeart Media app on your smart phone as well as http://www.tampabayradio.com! The first half of the show was all about documenting and inventorying your home or business to protect yourself against tragedy or theft in the event of a loss. Debra Palmer, Certified Inventory Specialist and Owner of Palmer Home & Business Inventory Professionals was in studio to discuss this topic which is the focal point of her business. Debra is a lifelong entrepreneur in the Tampa Bay area going back to 1988 and in 2013 was introduced to the concept of 3rd party inventories and spent extensive time researching the industry. Her research convinced her of the need for more of this in our area and Debra launched her company which was her 3rd startup business in the entrepreneurial path. We discussed this and much more on the show including how she inventories/documents items for owners and her cloud based inventory system which anyone who uses her services will have access to for easy off site reference of assets from checking on serial numbers of an asset to verification of personal belongings in the event of an insurance claim. Debra stressed the importance of privacy when she deals with the belongings of her clients and takes great care in ensuring prompt and accurate documentation of your assets. 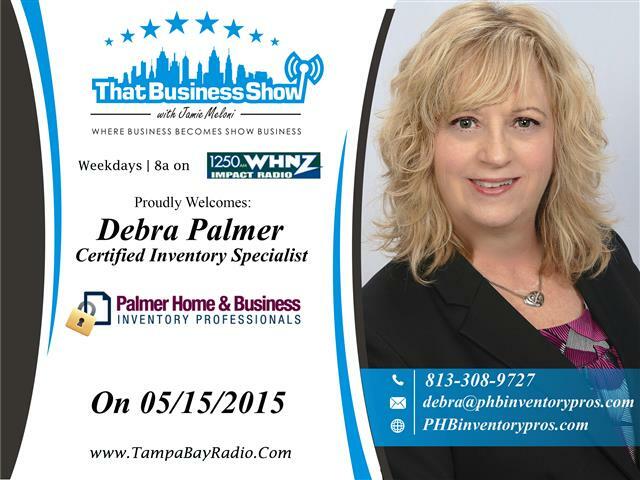 Learn more about Debra and her business at http://www.phbinventorypros.com and contact her today at 813-308-9727 or email at debra@phbinventorypros.com to assist you with your home/business inventory services! 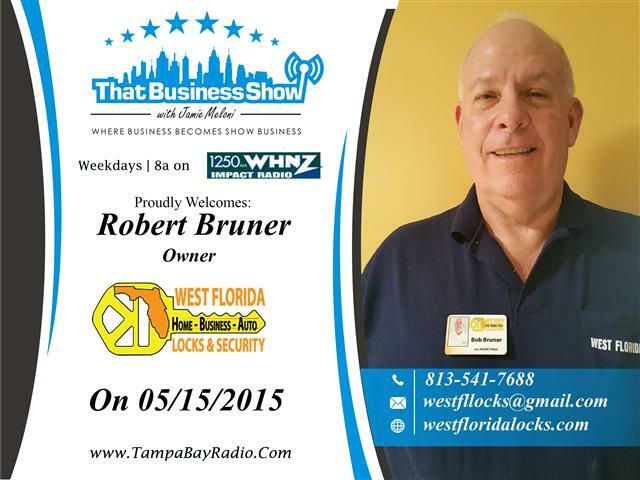 Robert Bruner, Owner of West Florida Locks and Security was in studio for the 2nd half of the show. Robert aka Bob specializes in locksmith services and we discussed his profession and I picked up some great information on this segment about locks in general. Bob and his company pride themselves on professional and courteous service to their clients and offer 24/7 Emergency Services. Bob discussed this and shared some great tips that consumers need to be aware of from the quality of some of the different lock providers to the prevalence of “lock bumping” a security concern that people need to be aware of. Family owned and operated, West Florida Locks specializes in residential, commercial and automotive locksmith services. They proudly serve all of the Tampa Bay Area, including Hillsborough, Sarasota, Pinellas and Pasco counties and are prepared for any kind of lockout or rekey situation. Learn more at http://www.tampaneedalocksmith.com or call 813-280-0017 for locksmith services today, available 24/7! Thank you Jamie for giving me the opportunity to talk your listeners about by home and business inventory documentation services. I really enjoyed my time in the studio with you and your media team and I especially enjoyed sharing the “stage” with Bob Bruner of West Coast Locks and Security. Thank you Jamie for giving me the opportunity to talk your listeners about my home and business inventory documentation services. I really enjoyed my time in the studio with you and your media team and I especially enjoyed sharing the “stage” with Bob Bruner of West Coast Locks and Security.